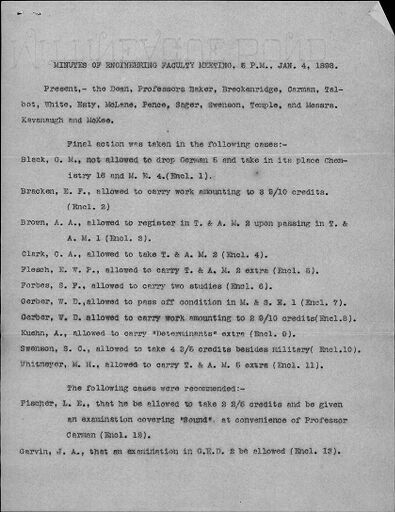 Minutes of the College of Engineering faculty, 1897-1902, 1918-2008, include correspondence, meeting agendas and minutes, reports, resolutions, committee nomination slates and election ballots, and proposals relating to requirements for admission, courses, and graduation; registration procedures; proposed revisions to the curriculum (e.g. the introduction of a master's program in Electrical Engineering and a Ph.D. program in Industrial Engineering) and college bylaws; faculty committees; petitions; grading; requirements for theses; special guest lectures; and the publication of the Technograph. This series also contains background documents for meetings of Heads, Directors, and Deans as well as memorials for faculty members. The Faculty Minutes (Digital Surrogates), 1897-1902, 1918-2008 are managed by the University of Illinois Archives and do not feature precise descriptive information for each item. Discover their contents by browsing the folders and files. For more information, contact an archivist at illiarch@illinois.edu.